17.51.080 Revision of the official site plan. 17.51.090 Private roads and vehicular circulation. 17.51.110 Maintenance of open space and utilities. A. The PRD designation shall be utilized as an overlay on residential zones. PRDs shall be denoted as follows: PRD (9600), PRD (MR), etc. The PRD overlay may be applied only to the MR, MRD, RD 7.2, RD 8.4, RD 9.6(S), RD 12.5(S), RD 20.0, CB, PCB and WFB zones. A. The applicant shall present plans, reports, and related information in sufficient detail to enable the planning department to evaluate the proposed development in accordance with the provisions of this chapter and make recommendations to the appropriate permit authority as outlined in Chapter 17.13, Project Permit Review Procedures. 3. Other information as determined necessary for adequate design review shall be requested within twenty-one days from date of application. C. The applicant shall submit one copy of the proposed PRD site plan to the Snohomish Health District, along with soil analysis data where on-site septic systems are proposed. 4. Multiply the resulting number of units by 1.2 for all PRDs. B. Open Space and Recreation. Twenty percent of the new development area shall be established as open space and community recreational facilities. For all PRDs up to one-half of the common open space land may consist of unbuildable land upon a showing that such land can and will be utilized in a specific recreational use. C. Underlying Zone Requirements. Unless specifically modified by this chapter, all requirements of the underlying residential zone shall apply within the planned residential development. D. Minimum Lot Width. Except for townhouse lots, the minimum lot width shall be sixty feet for interior lots and sixty-five feet for corner lots. There shall be no minimum lot width for townhouse lots. E. Minimum Lot Area and Bulk Requirements for Single-Family Dwellings and Duplex Dwellings. 1. The minimum lot area shall be five thousand square feet. 2. The minimum front building setback shall be one-half the width of planned right-of-way or easements as measured from the centerline of the right-of-way plus fifteen feet. 3. The sum of side setbacks shall be not less than ten feet. If the side setback adjoins public open space, these setback requirements may be reduced by an amount equal to the distance from the property line to the centerline of the open space. A modified setback shall be endorsed upon the approved site plan. No portion of a building or appurtenance shall be constructed as to project into any commonly owned open space. No structure or portion thereof shall be closer than six feet to any structure on an adjacent lot. 4. Rear setbacks shall be a minimum of five feet. If the rear setback adjoins public open space, the minimum rear setback requirements may be reduced by an amount equal to the distance from the rear lot line to the centerline of the open space. Such modified setback shall be endorsed upon the approved site plan. No portion of any building or appurtenance shall be constructed as to project into any commonly owned open space. 5. The maximum lot coverage shall be thirty-five percent of the lot area or two thousand five hundred twenty square feet, whichever is greater. 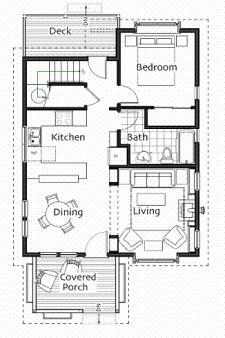 F. Minimum Lot Area and Bulk Requirements for Townhouse Dwellings. 1. Minimum lot area per dwelling unit shall be an average of two thousand square feet. 2. Every townhouse lot shall have a front setback of not less than fifteen feet, and a rear setback of not less than five feet, both measured from the property line; provided, that when two or more townhouse dwelling units are being developed on adjacent lots, minimum front setbacks may be reduced by not more than ten feet in order to give individual identity and privacy to the units, as long as the average of all front setbacks in a townhouse structure is not less than fifteen feet, and each lot has a combined total of thirty feet of front and rear setbacks. 3. Every townhouse at each end of a group of attached units shall maintain a side setback of not less than five feet with a minimum building separation of not less than ten feet; provided, that if the side setback adjoins public open space, this setback requirement may be reduced by an amount equal to the distance from the side lot line to the centerline of the open space. Such modified setback shall be endorsed upon the approved site plan. No portion of any building or appurtenance shall be constructed as to project into any commonly owned open space. 4. Bulk and Setback Variation. Each townhouse structure shall have horizontal or vertical variation either within each dwelling unit’s front building face and/or between the front building faces of all adjoining units to provide visual diversity to the townhouse structure and individual identity to townhouse units. Upon building permit application, a plot plan of the entire structure in which each unit is located shall be provided by the builder to show compliance with this requirement. The planning division shall review and approve or deny the building design which may incorporate variations in roof lines, common wall “fin” extensions, setbacks and other structural variations. b. Patios, driveways and walkways shall not increase the total lot coverage to more than sixty-five percent of the lot, unless paved with perforated concrete blocks or other permeable material. 6. Townhouse building height shall not exceed thirty feet. The PRD standards of Section 17.51.050 may be modified as listed below when an applicant submits the submittal material required by Section 17.51.045. A. Minimum Lot Width. Except for corner lots, the minimum lot width may be reduced to fifty feet for all single-family lots and to forty feet for all lots within a single-family zero lot line development. B. Minimum Lot Size. The minimum lot size may be reduced to four thousand square feet on lots within a single-family zero lot line development. 1. The minimum front building setback of single-family dwellings on local access streets shall be one-half the width of planned right-of-way or easements as measured from the centerline of the right-of-way plus ten feet. Setbacks, building envelopes and landscaping shall be varied to result in a visually interesting streetscape. The length of the driveway between garages or carports and the right-of-way or easement shall be at least fifteen feet. 2. The minimum setback on one side and/or rear yard in a zero lot line development may be reduced to no more than one inch if appropriate provisions are made for maintenance easements in the PRD plan, in the plat and in the declaration of covenants, conditions, and restrictions. D. Content of Maintenance Easements. A five-foot minimum maintenance easement shall be shown on the approved official site plan or plat. Said easement shall be established in the covenants, conditions and restrictions of the adjoining lot to assure access to the lot line wall at reasonable periods during the day for normal maintenance. A two-foot maximum eave easement shall be established within the maintenance easement if roof overhangs are proposed. E. Lot Coverage. The maximum lot coverage for lots within a single-family zero lot line development may be increased to fifty-five percent of the lot. 1. Allow single-family alternative housing options on single-family zoned parcels adjacent, including across the street in some cases, to multifamily, commercial and industrial zoned parcels, not including commercial or industrial uses limited by the Paine Field Overlay, as a transition to multifamily, commercial, and industrial uses, and in multifamily zones and in some commercial zones that allow for mixed-use projects. 2. Allow for a limited number of sites as a transition to multifamily, commercial and industrial uses. 3. Ensure that this transition development blends with existing adjacent single-family residential areas to ensure the character of existing neighborhoods is maintained. 4. Promote variety in the size and type of new dwelling units to enable households of different ages and sizes to live at the edge of single-family neighborhoods and without disrupting the intent of single-family neighborhoods. 5. 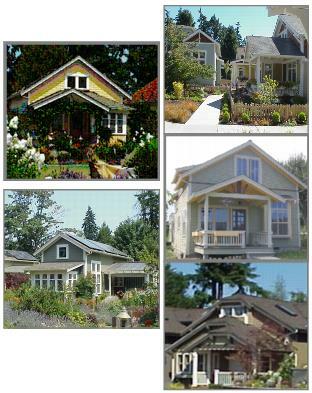 Encourage cottage housing that is a single-family structure and harkens back to the size, proportionality and character of craftsman-style homes built in the 1910s to 1930s, which are less bulky and provide more opportunities to create larger areas of open space than larger homes which tend to consume the lots. 6. Although the density per acre is two times that of the underlying zoning, the size and proportionality or massing of the cottage units are smaller than the larger home construction of single-family homes being built between 1990 through 2005 and the overall density can be similar depending on the parcel of land being developed and thus provides a single-family housing option for households of smaller size. B. Character of Cottage Housing. The character of cottage housing is smaller scale, has common open space that is central to the unit clusters, and thus is not intended to be compact housing or small lot development in a standard subdivision. e. With a conditional use permit. 2. In the PCB(S) zone with an approved development agreement. 3. Outright in MRD and MR PRD zones. 4. Outright in the community business (CB) and planned community business (PCB) districts as part of a mixed-use development. a. Cottage housing development may not be developed on parcels in single-family zoning districts that are on streets that have single-family residences on both sides, even if the adjacent property is zoned multifamily, commercial or industrial. The intent of cottage housing is to have it provide a transition to single-family neighborhoods and to ensure the established neighborhoods remain intact. b. Parcels cannot be subdivided in order to have two cottage developments of eighteen cottages each to avoid the maximum number of cottage units per development limit. a. Residential. A single-family parcel adjacent to multifamily, commercial or industrial zones that is the size and dimension that allows for a minimum cluster of four cottage units and large enough to provide all the open space, parking, and setback requirements. Typically this would be one-half acre in size if the parcel is adjacent to a commercial, multifamily, or industrial zone and has access off of a collector or arterial street. b. Commercial/Multifamily. Greater than one acre in MRD, MR, CB and PCB zones. 2. Density. Maximum densities for cottage housing projects shall be determined based on Table 1. In single-family residential zones, each cottage housing project shall not consist of more than eighteen cottages nor fewer than four cottages. If the parcel size allows for more than eighteen cottages, then the project must consist of a combination of cottages and detached single-family residential units in single-family zoning or cottages and multifamily in multifamily and commercial zones. The cottages shall be clustered according to these regulations and the single-family residential development shall follow the underlying zoning requirements. Note 1: All other open space, parking and setback requirements must be provided. In CB and PCB the mixed-use requirement must also be provided in addition to the open space and parking requirements and these will all likely reduce the density that is attainable. 3. Floor Area. Ramblers or one-story cottages shall not exceed a maximum of one thousand square feet on the main floor, excluding garages. One and one-half story buildings shall not exceed a maximum of twelve hundred square feet with a maximum of eight hundred square feet maximum on the main floor, excluding landing and stair areas, second story ceilings less than six feet in height and garages. Cottages shall not be a full two-story coverage of the main floor (two-story narrow, skinny houses are not allowed). Single-car garages are allowed to be attached to the cottage if the garage is accessed from the side or rear of the unit; no garage may be accessed from the front facade of the building. A covenant restricting building expansion shall be required on all developments. 4. Cottage Development Cluster Size. A minimum of four units is allowed with a maximum of twelve units in a single cluster. Multiple clusters are allowed provided each housing cluster meets the common and private open space requirements and there are pathways connecting the common open spaces. The maximum number of cottages per development is eighteen cottages. 5. Application of Critical Areas. a. The critical area regulations contained in Chapter 17.52 apply to all cottage developments. ii. Multifamily and Commercial Zones. Density for multifamily and commercial zones shall be calculated as the total site area times the density shown in Table 1 whether or not it contains critical areas. b. Critical areas and their buffers should be designated as native growth protection areas (NGPAs) and appropriate signage be installed and maintained. The management of these NGPAs is the responsibility of the homeowners’ association, an organization that is required for the joint maintenance and upkeep of the common areas developed as part of cottage development requirements. The NGPA will also provide habitat for wildlife and residents and the homeowners’ association shall be notified of the intent, designation and functions these areas are intended to provide even in an urban setting. a. Four hundred square feet of common open space is required per unit. b. Fifty percent of units must have their main entry on the common open space. c. All units must be within eight feet of each common open space(s). d. Setbacks and private open space cannot be counted towards the common open space calculation. e. One common open space must be located centrally to the project, with multiple clusters having multiple common spaces with pathways connecting the common open spaces. f. Community buildings or clubhouses can be counted towards the common open space calculation. g. Passive trails within an NGPA are allowed and may count towards the common open space requirement. h. Common open space may be separated from the central common open space that is required for the clusters, but can only account for twenty-five percent of the requirement. i. Cottages must surround the common open space on a minimum of two sides of the green. j. Common open space shall be located outside of stormwater/detention ponds, wetlands, streams, lakes, and critical area buffers, and cannot be located on slopes greater than ten percent. k. The common open space area shall include usable public spaces such as lawn, gardens, patios, plazas or scenic viewing area. Common tables, chairs and benches are encouraged. An active recreation element may be included if the homeowners’ association so chooses and it does not dominate the common open space. Where applicable, native vegetation and LID BMPs may be used in fifty percent of the passive open space area. a. Two hundred fifty square feet of private open space is required per unit. b. The private open space must be a minimum of ten feet wide and adjacent to the front or side of the unit; side yard easements may be counted toward the private open space requirement. The main entrance of the house shall front on the private open space via either a front porch or to the side by using a wrapped porch. Porches with railings are preferred to create private space. c. The private open space, on either the front or side yard, must be oriented toward the common open space. d. A fence or hedge not to exceed three feet in height may separate the private open space from the common open space. 8. Building Heights and Setbacks. a. Setbacks from the external property lines of the original or perimeter of the parcel shall be as shown in Table 2.
b. All buildings shall be separated by at least eight feet. Minor architectural features may extend one foot into the separation distance as long as six feet of clearance between buildings is maintained for fire separation purposes. c. The area under ceilings less than six feet in height is not included in the square footage calculation of the structure. • Safety of pedestrian and vehicular traffic. i. A six-foot sight-obscuring, decorative fence (no chain link fences) shall be provided. Adjoining, adjacent and connecting fences shall be considered and constructed of similar materials unless otherwise approved by the planning director. (A) Evergreen trees planting in a double row layout designed to create a hedge/screen maturing at twenty feet within five years created by one tree per ten lineal feet of buffer with a maximum spacing of fifteen feet between trees with fifty percent of the trees being six to eight feet in height and fifty percent of the trees being eight to ten feet in height. (B) Shrubs eighteen inches in height and circumference or multi-stemmed trees six feet in height, that are a mixture of species with the total quantity averaging five feet on center for the lineal portion of the buffer. (C) Ground cover of an evergreen variety of four-inch pots shall be planted to achieve ninety percent coverage within three years of the time of planting (eighty percent coverage at the time of the two-year landscape performance bond sign-off). iii. Any landscape berming shall be coordinated with adjacent property owners to provide retaining walls as needed, to handle stormwater runoff so that it does not impact the adjacent property, and to provide consistency or benefit to the adjoining property owner increasing privacy from the new infill development. iv. Native plant species are encouraged to be used if this better blends the new and existing development transition. Graduated buffers with high vegetation along the property line and lower-growing vegetation next to the units may be considered if full screening is provided within two growing seasons. b. Cottages greater than one story shall provide a ten-foot densely planted vegetative screen (ten- to twelve-foot trees must be planted in the row adjacent to the fence) to buffer existing development and must follow the requirements in subsections (D)(9)(a)(ii), (iii) and (iv) of this section. c. Natural vegetation may be allowed in place of fencing and screening if the project is adjacent to natural ravines or other features that provide an equivalent screening. d. Drought-tolerant plants and native species are encouraged to be used to promote water conservation and so plantings will flourish over the long term of the development. e. Vegetation shall be maintained and replacement is required to maintain the perimeter buffer. Nonnative or noxious weeds shall be removed. Any tree cutting must be approved by the homeowners’ association and coordinated and approved by the planning director. 10. Landscaping Required for Parking Lots. The purpose of parking lot landscaping is to soften the visual appearance, screen views of parking lots, add shade, limit the amount of impervious surface and reinforce safe pedestrian access to buildings and connecting sidewalks. i. One tree for every six parking stalls. Trees to consist of shade canopy deciduous trees a minimum of two-inch caliper. ii. Three shrubs of eighteen-inch height shall be provided for every one hundred fifty square feet of parking islands and parking lot landscape areas. iii. Evergreen ground cover using four-inch pots with twelve-inch spacing or one-gallon containers with eighteen-inch spacing. iv. The total area of all interior landscaping shall be equal to or greater than ten percent of the parking lot area (including parking, maneuvering, loading and fire access areas). a. Deciduous canopy trees of two and one-half inch caliper will be planted twenty feet on center to form a street tree configuration along the adjacent street and to provide separation between the parking lot and the street. b. Parking lots adjacent to streets shall have evergreen shrubs of twenty-four-inch height planted in the form of a hedge to achieve a solid visual screen to the height of thirty-six inches within three years of planting. Plants shall be a minimum of twenty-four inches in height at the time of planting and planted no more than two feet on center. c. Evergreen ground covers will be planted to achieve ninety percent coverage within three years from the time of planting. 12. Lot Coverage. Buildings or structures may cover up to fifty percent of the lot. Up to sixty percent of the lot may be covered by impervious area. 13. 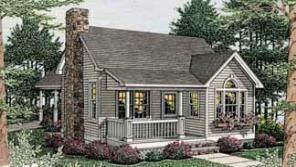 Cottage Structure—Attached Front Covered Porches. a. Porches shall be a minimum of eighty square feet and a minimum of eight feet deep on the front of the building and six feet deep on a side where the porch wraps around the building. The square footage of the porch may be reduced to sixty square feet (six by ten feet deep) on units less than eight hundred total gross square feet. b. Porches shall be oriented towards common open space or street and designed to provide a sense of privacy between units. c. Secondary entrances facing the street and sidewalk are required to have a minimum five-by-five-foot porch. a. Building height shall be as shown in Table 2: Setbacks for Cottage Housing. To provide variability in design a minimum of two cottage heights are required within a project cluster and only one out of every three cottages may be built up to the twenty-five-foot height limit. The cottages with the twenty-five-foot height shall also be set back as provided in Table 2 to provide a staggered view from adjacent properties—taller buildings farther away from existing single-family residential buildings. b. Pitched roofs are required (6:12 and/or 4:12 with dormers). No flat roofs are allowed. The planning director may approve other roof pitches and pitches for nooks or architectural features such as bay windows. 15. Building Design Standards—Including Garages/Parking Structures. 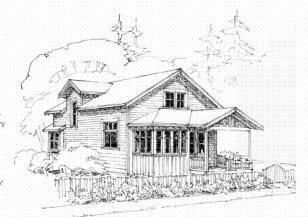 The purpose of design standards is to: encourage variety and visual interest in new residential development in a manner that is compatible with the neighborhood character; ensure the scale of the cottages is proportional to their lot and parcel size; provide landscaping between new and existing development to buffer and provide a transition, to enhance the building and site appearance, and to maintain the quality of the neighborhood. a. Design Standards Approval. The planning director shall decide compliance with the site design, architectural, site and landscape standards before the hearing examiner holds a public hearing and after a required neighborhood meeting is held to review and comment on the project. Cottage designs such as in Attachment A at the end of this section are encouraged. b. Cottage Character and Site Layout Compatibility. The cottages and site design shall provide variety and visual interest as well as working with the land to provide compatibility with the character of the land and the surrounding neighborhood. Site design shall take into consideration where existing significant trees are, where existing neighboring homes are located, and shall leave critical areas undisturbed. Cottage developments may not be built on slopes of thirty percent or greater nor are they eligible for transfer of density credits. Wetlands, streams, and their buffers shall be placed into a designated NGPA and the density for the remainder of the site shall be based on Table 1 in subsection (D)(2) of this section. c. Infill Site Requirements. Window orientation shall avoid creating privacy issues especially for existing adjacent homes and within the cottage development. 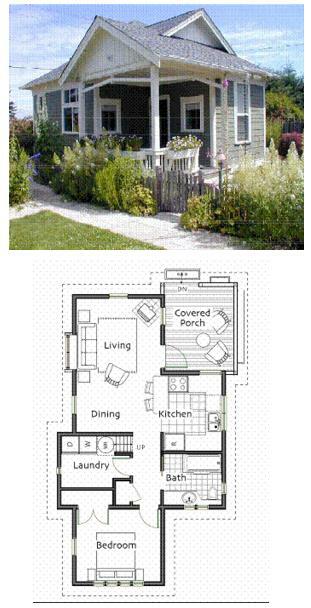 A site analysis and inclusion of adjacent neighbor home location, building height and windows and views must be provided as part of the site analysis and be used in carefully siting new structures in the cottage development. 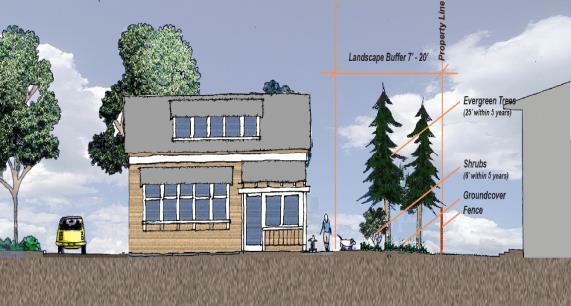 Modulation of the building height should be used to decrease the impact of new development on adjoining existing homes. Stepped-roof building designs are an example of this strategy. d. Pedestrian Connection. Provide pedestrian connections internally and externally both for safety and convenience and to promote neighborhood pedestrian activity and transit use. e. Incorporating New Development Techniques and Technology. Utilize new development techniques to reduce impervious surface, by using low-impact development techniques and new technologies as well as recycled materials wherever possible. f. Building Character Proportionality and Massing. Size and height reductions of cottage housing, design techniques and perimeter buffer landscaping shall be used to promote compatibility with the surrounding neighborhood and proportionality and massing of new cottage development adjacent to existing single-family neighborhoods. g. Variety in Buildings and Visual Interest with Consistency in Architectural Style. The building designs and layout shall prevent the repetitive use of the same combination of building features, building layout and site design elements within any cottage development, clusters and adjacent dwellings. i. Varied and Interesting Rooflines. Varied and interesting rooflines must be provided which include use of varied pitched roof styles, gables, or dormers. Roof breaks or step-downs are encouraged and can be used to reduce required setbacks adjacent to parcel boundaries. ii. Separation of Identical Buildings and Elevations. Units of identical elevation types must be separated by at least two different elevations. This will result in at least three different building elevation plans per cluster. No two adjacent structures shall be built with the same building size or orientation (reverse elevations do not count as a different building elevation), facade materials or colors. iii. Different Roof, Window Design and Entries. Provide differing roof forms, gables or dormers. Roof overhangs a minimum of six inches are required. Different window design, entry treatments and base treatments shall be utilized to help achieve variety. iv. Corner Lot Cottages. Cottages on corner lots shall be architecturally designed to provide modulation and detail on both frontages. Examples of modulation include use of bay windows, wrapped porches, and dormers. 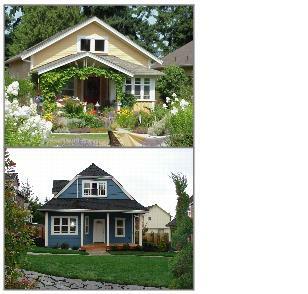 v. Open and Closed Cottages along Private Side Yards. Private side yards are an important element in cottage development. The side yard is typically designated to a particular cottage (like zero lot line homes) and this cottage should be open to the side yard using doors, windows or a wrapped porch. The adjacent cottage should have a closed side and window placement is an essential part of the design to achieve this relationship. i. Variation in building type and size. ii. Variation in layout and orientation. iii. Variation in building materials, mixture and texture. (A) Vertical Changes. Changes in materials in a vertical wall shall occur at an internal corner or a logical transition such as aligning with a window edge or chimney. (B) Horizontal Changes. Transition in materials on a wall surface, such as shingle or lap siding, shall be required to have a material separation, such as a trim band board. (C) Acceptable Exterior Wall Material. Wood, cement fiberboard, stucco, standard sized brick and stone may be used. Simulated stone, wood, stone or brick may be used to detail homes. (D) Trim. Trim may be wood, cement fiberboard, stucco, or stone materials. Trim is required around all doors and windows. The trim must be three and one-half inches minimum and be used on all elevations. v. Building intervals and articulation. vi. Varying roof shapes, pitches and gables. vii. Varied roof heights and roof breaks or roof extensions. ix. Window trim and mullions. x. Bay windows or bump outs. xiii. Use of varied siding, trim and base colors. xiv. At a minimum use bottom and top material treatment and if recommended use tripartite architecture. xviii. Other building elements and the combined use of the above shall be approved by the planning director. a. All loading, trash, recycling and storage areas shall be located so they are not visible from streets and will be concealed. b. An architectural screen shall surround all sides except the access entry. Building walls of adjacent structures may be used to partially satisfy this requirement. Screen walls shall be a solid visual screen constructed out of metal, concrete, and/or masonry units; or other materials similar to the cottages and garage structures. 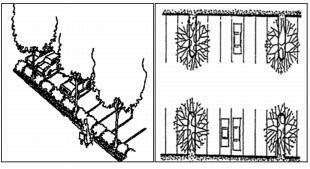 Required gates and trellises, and other architectural screening elements, shall be designed so that they complement the surrounding buildings unless there is some overriding fire access issue. c. A concrete slab shall be installed as the base material within the enclosure. 17. Community Buildings. Commonly owned building(s) are allowed but not required and they must be incidental in use and size to the rest of the development. 18. Homeowners’ Association. A homeowners’ association and covenants are required for the maintenance of the common areas and buildings. 19. Accessory Dwelling Units. Accessory dwelling units and/or extended-family dwelling units are not allowed in cottage housing developments. a. Two stalls per unit. b. One-half stall per unit for guest parking. 21. Parking Lots and Stand-Alone Parking Structures. a. At least one parking stall per unit must be within an enclosed parking structure or garage. Carports are not considered an enclosed structure. 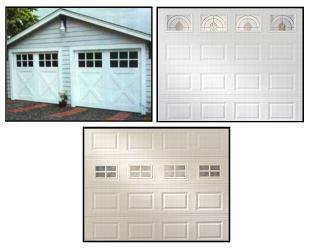 Garage doors shall feature windows, recesses, or moldings to help blend the doors with the character of the house. Garages facing the sidewalk and public street shall have features that add interest to any blank walls. b. Stalls and garages must be screened from public streets or abutting residential properties. iii. The garage, landscaping, and/or fencing shall screen parking next to a side street. d. Parking lots and garages must meet the front yard setback requirements of the underlying zone where they are adjacent to a public road or ten feet from a private road, or the setback requirements as listed in subsection (D)(8) of this section, Building Heights and Setbacks. e. The parking areas must be clustered and separated from the common area by landscaping or an architectural screen. f. The parking area should not be the major view from the public right-of-way or street. Landscaping and/or cottage unit or the common area should provide the view into the cottage development, unless there are fire code restrictions that make this unachievable. g. All garages shall be located in an area to minimize the presence of the automobile. h. All garages shall follow an architectural style similar to the cottages. i. Garage rear and side elevations facing the public street or adjacent existing development shall have architectural details to minimize the impact of the facade. j. Garage massing should be broken up wherever possible by using topographic differences, using roof breaks or step-downs, or creating smaller combined garage increments. A six-single-vehicle-stall garage is the maximum number allowed in any garage building. Four garage units or less is the preferred design. The planning director may approve other methods to meet the intent of this section. a. Internal access to the development shall be treated like a private driveway system or woofner. The development must meet the requirements of the fire department for access and safety. At a minimum the access way shall consist of a thirty-foot-wide driveway accessing onto a public street. A five-foot-wide pedestrian sidewalk must connect the public sidewalk system to the common open space and a five-foot landscape strip shall be provided between the driveway and the sidewalk. Other configurations can be approved by the public works director. The sight distance must comply with the requirements of Section 17.20.060.
b. The abutting public or private street must meet the city’s development standards for street improvements including right-of-way, curbs, gutters, and sidewalks, unless approved by the public works director. c. If access to a cottage development is via a panhandle, no landscape buffer will be required in the panhandle portion of the lot. 23. Drainage. Development shall meet the most current drainage standards in effect at the time the permit application is deemed complete and must be approved by the public works director. Stormwater management shall minimize erosion during construction so that no turbid water leaves the site and will manage stormwater so that it is detained and any water released from the site meets water quality standards as mentioned above. Drainage is a key issue related to infill development within the city and the development shall not impact adjacent properties and shall handle any water that previously was dispersed to the site from uphill adjacent properties. Standard: Structures must include building articulation, change in materials or textures, windows, or other architectural features. Variety in Building Design, Character and Height Standard: Structures shall be varied in height, size, proportionality, orientation and rooflines. The character is encouraged to reflect the smaller craftsman-style homes built in the 1910s to 1930s. One-story cottages eighteen feet in height and partial one and one-half stories up to twenty-two to twenty-five feet in height are allowed. Standard: Structures shall vary in design, size, orientation, layout, roof pitches and building materials. Standard: Interesting rooflines must be provided which include use of varied pitched roof styles, gables, or dormers. Standard: Differing roof forms, gables or dormers, window design, entry treatments and base treatments shall be utilized to achieve variety. Standard: Cottages surrounding a common open space with parking to the side of the project. Standard: Garage doors shall feature windows, recesses, or moldings to help blend the doors with the character of the house. 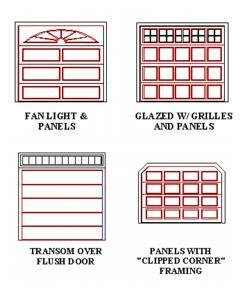 Example: Design Elements—Various door styles with decorative features. Standard: Porches shall be a minimum of eighty square feet and a minimum of eight feet deep on the front of the building and six feet deep on a side where the porch wraps around the building. Standard: Perimeter landscaping shall be provided to create visual relief, visual separation, and site-obscuring screening between the cottage development and the adjacent property. Standard: All dumpster containers, individual refuse containers, and trash compactors shall be enclosed. • Trash enclosures shall not be visible from the street. • An architectural screen shall surround all sides except the access entry. • Walls shall be constructed out of metal, concrete, and/or masonry units. • A concrete slab shall be installed as the base material within the enclosure. Standard: Soften the visual appearance of the parking lot next to the street. • Deciduous canopy trees of two and one-half inch caliper shall be planted twenty feet on center. • Parking lots adjacent to streets shall have evergreen shrubs twenty-four inches in height planted in the form of a hedge to achieve a solid visual screen to the height of thirty-six inches within three years. • Shrubs shall be a minimum of twenty-four inches in height at the time of planting and planted no more than two feet on center. • Evergreen ground covers will be planted to achieve ninety percent coverage within three years from the time of planting. Standard: Soften the visual appearance, screen the parking lot from the street, and add shade to the parking lot. • One tree for every six stalls. • Three shrubs eighteen inches in height for every one hundred fifty square feet of parking islands. • Evergreen ground cover using four-inch pots with twelve-inch spacing or one-gallon pots eighteen inches on center. • A minimum of ten percent of the parking lot shall be landscaped. A. The site plan as approved by the planning commission shall become the official site plan of the PRD and any changes thereto shall require review under the provisions of Section 17.51.080. B. The official site plan and its associated conditions shall be considered extensions of the regulations of this title, and their existence shall be noted on the official zoning maps. 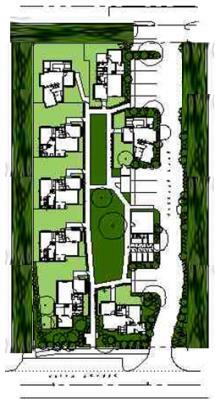 C. All development within an approved PRD shall conform to the official site plan and associated conditions. In order to assure compliance, a bond or other guarantee of performance may be required by the city. Satisfactory performance of required common open space, landscaping and other improvements may be required prior to occupancy of units in the PRD project. A. Minor Revisions. Minor revisions or changes in the official map may be permitted by administrative action by the planning director and shall be properly recorded within the rezone file and as a part of the records for the approved building permits. B. Major Revisions. Major revisions of an official site plan shall be processed in the same manner as an original application. C. Determining Major, Minor Revisions. A “major” revision means any proposed change in the basic use in a PRD, or any proposed change in the plans and specifications for structures or location of features therein, whereby the character of the approved development will be substantially modified or changed in any material respect or to any material degree. A “minor” revision means any proposed change in an official map which does not involve a substantial alteration of the character of the PRD. The determination of whether a proposed change is a “major” or “minor” revision shall be made by the planning director in accordance with the foregoing principles. Private roads which use a modified design standard as provided by this section, may be permitted upon approval by the director of public works and appealable to the city council. A. General Criteria. The right-of-way width, paved sections and other features of the on-site road system shall reflect the scale of the proposed development and the intended function of the road relative to lot access, parking, emergency vehicle circulation and access to adjacent properties. B. Design of Modified Roads. Minimum road width pavement standards allowed under the design modifications permitted by this section shall be a twenty-foot width, with a fourteen-foot vertical clearance from the road surface; provided, further, however, that such design modified roads shall be constructed to city road base standards, as depicted by typical roadway cross sections of the department of public work’s design standards and specifications manual. C. Fire Lane Striping. Roads so modified as provided in this section shall have a fire lane striped or posted. For roads in excess of twenty feet, the requirement of fire lane identification shall be waived. D. Parking. Consideration shall be made to ensure adequate parking in a PRD. Occupant parking shall be provided at the rate of four spaces/single-family unit. Guest parking shall be provided at the rate of one-half space/single-family unit. All parking requirements may be met including garage areas, driveways, grouped off-street parking areas and on-street parking; provided, further, however, that when roads are modified as provided for in this section, on-street parking is prohibited if the road pavement width is less than twenty-eight feet. If the road pavement width is between twenty-eight feet and thirty-six feet, only one side of the road shall be a designated parking lane.